Is This Gas Utility Set to Power up Your Portfolio? Shares of ONEOK (NYSE: OKE) hit a 52-week high on Friday. Let's take a look at how it got there and see if clear skies are still in the forecast. A natural gas utility hitting a 52-week high despite an implosion in natural gas prices? You better believe it! ONEOK has ridden the success of its limited partnership ONEOK Partners (NYSE: OKS) to success in recent months. A boom in natural gas finds has vastly increased the need for gathering and processing natural gas liquids and gases. In the second quarter, for instance, profits rose 13% for ONEOK Partners to $228.1 million. As long as investment dollars continue to flow to midstream activities, there's little reason to believe that ONEOK Partners' profits won't head higher. However, distribution and energy services have been taking it on the chin due to lower demand caused by an unseasonably warm winter and spring, as well as historically low natural gas prices. This dip in demand coupled with lower prices is what prompted Chesapeake Energy (NYSE: CHK), among many other drillers, to cut back on capital expenditures and switch its production focus from gas to liquids (oil and natural gas liquids). Although natural gas prices have rebounded well from their lows, they still have a long way to go before drillers would again choose to boost production. Let's see how ONEOK stacks up next to its peers. No real differentiation here as ONEOK, OGE Energy (NYSE: OGE), and Enterprise Products Partners (NYSE: EPD) have traded more or less in tandem. Let's see if there are differentiating factors in their metrics. Holy leverage batman! If there's one constant about this comparison it's that all three companies are more than willing to use debt to finance their infrastructure expansion. 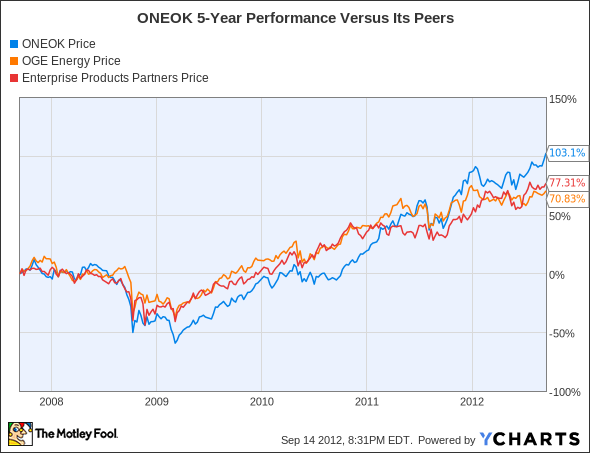 On multiple levels ONEOK appears to be the most expensive gas utility based on these metrics. OGE offers the best overall value on paper with Enterprise Products Partners paying shareholders a dividend that's about 2% higher than what ONEOK shareholders receive -- although it's worth mentioning that as a limited partnership, Enterprise Products' costs are lower, allowing for a higher dividend. Yet, on multiple fronts, the similarities between these companies are uncanny. OGE also reported a drop in revenue in its most recent quarter due to weather-related lower natural gas prices and demand. OGE, however, noted its biggest gains from the transmission of natural gas. Enterprise Products also saw revenue fall 13%, but through a multitude of new joint ventures was able to boost its profits and increase transmission revenue. Now for the $64,000 question: What's next for ONEOK? That question depends on the underlying price of natural gas, how well ONEOK deals with its ballooning debt levels, and how quickly natural gas demand returns. Our very own CAPS community gives the company a three-star rating (out of five), with an overwhelming 96.3% of members expecting it to outperform. Although I've expressed optimism in ONEOK's long-term outlook previously, I've yet to make a CAPScall on the company in either direction and won't be making one today. There are plenty of reasons to like ONEOK, including its location in the heart of recent major natural gas finds, and its position as a leading transmitter of natural gas. I also firmly believe that its useless trying to blame ONEOK's poor performance on the weather, as the weather is impossible to predict. ONEOK has successfully chartered multiple natural gas pullbacks before, so there's little reason to think it won't succeed again. However, at 20 times forward earnings and closing in on $6 billion in debt, I'm concerned enough not to initiate a CAPScall here. With energy prices likely remaining volatile over the next couple of years, our analysts at Motley Fool Stock Advisor have pinpointed the one energy stock you need to own before 2014. Find out the identity of this stock by clicking here to access this free report.